Capture the magic of a couple's first kiss as husband and wife with this classic, keepsake print. Capture the magic of the couple's first kiss as man and wife. Chicago-based artist Alexander Doll set scenes of wedded bliss in the context of a classic print announcement that is as stunningly unique as it is timeless. This nostalgic print hearkens back to the nuptial announcements of yesteryear with its sharp, sanserif typography, and hand-sketched illustrations featuring the dashing groom and his lovely wife pursed in anticipation of their first kiss as a married couple. Alexander incorporates personal details, such as the venue, city, date, and the couple's names to give each print a warm, personal touch. A sophisticated way to fete an unforgettable occasion, this inspired gift captures the couple's version of their fairytale while giving them a stylish and whimsical work of art to remember the thrill of the day with every passing glance. Printed on archival paper using archival pigment ink in Ohio. Never one to give an impersonal wedding gift, Alexander Doll looked for something original to give his friends. As a successful commercial artist, he decided to create something himself that recipients would cherish and display as part of their decor. 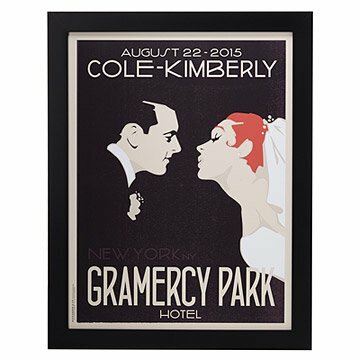 Alexander's personalized artwork became the perfect way to help couples commemorate their big day in classic style. Arrives ready to hang in a matte black frame made from a wood called Eucalyptus grandis sourced from Brazil. Bought this as a gift for my cousin and his bride. Came out beautifully and they loved it. Wonderful idea, commemorating date and location of a couple's first kiss. You can customize the hair and skin tones of the man and woman in the print, as well as the color of the typeface. The artist sent me proofs to approve in advance and was responsive when I requested a type color change. The print arrived perfectly framed and packed, and was a huge hit Christmas morning. Beautiful and meaningful piece of art! This was a beautiful and well-received wedding gift for our daughter and new son in law. A beautiful pice that looks like a vintage movie poster. I only gave it 4 stars because of the price. Otherwise, it is a beautiful piece of art. This was easy to order and it seemed as though a lot of attention to detail was put into it. The recipient loved the wall art and was so thankful. Overall a great experience. Picture was great and my wife loved it. The folks at uncommon goods and the artist were a pleasure to deal with, the artist offered to customize it even further by adding a beard for me and giving the guy a shaved head like I have for only a few bucks more. Ultimately I went with classic image shown on website. It was a smooth experience, and I'd highly recommend. My wife LOVED this. It's large, it's classy, and it's a beautiful reminder of our special day.